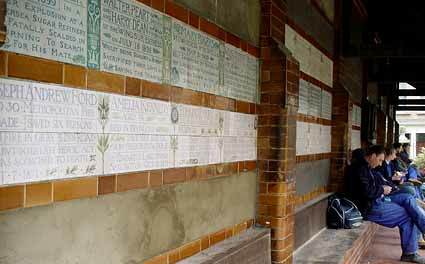 Tucked away from the hungry gaze of tourists is 'Postman's Park', a small patch of public green space in the City of London. Situated between King Edward Street, Little Britain and Angel Street (near St Bartholomew's Hospital) the park acquired its name due to its popularity as a lunchtime garden with workers from the nearby old General Post Office. The park was the brainchild of Victorian painter and philanthropist, George Watts G F Watts (1817-1904), the son of a London piano maker (he also created the statue of Lord Holland in Holland Park). Watts was a radical socialist who twice refused a baronetcy. He was very sympathetic towards the dreadful living conditions of the urban poor and made no attempt to hide his dislike of the greedy upper classes. In 1887, Watts wrote to the Times proposing that a park commemorating 'heroic men and women' who had given their lives attempting to save others would be a worthy way to mark Queen Victoria's Golden Jubilee year. His idea failed to find any backers, so he created the memorial himself in the form of a 50ft long open gallery in public gardens on the site of the former churchyard of St Botolph, Aldersgate. Along the walls of the gallery Watts placed glazed Doulton tablets commemorating acts of bravery, each one detailing the nature of the heroic act. The tragic tales documented in the Tablets tell are touching, often involving children and usually concerning fire, drowning or train accidents. View of the narrow entrance to Postman's Park, with an attractive small fountain in the foreground. The covered gallery in the distance contains the rows of commemorative Doulton tablets. The General Post Office has gone, but the park still remains a popular lunchtime destination for local workers. Here you can see the glazed tiles running along the back wall of the shelter. 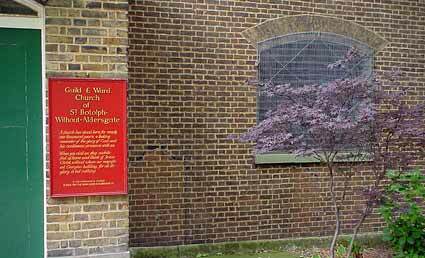 Facing the park is a side entrance to the grandly titled, 'Guild & Ward Church of St. Botolph-Without-Aldersgate'. A church has stood on this site for nearly a thousand years. The current Georgian building has a fine facade on Aldersgate Street. The tablets were made at the Doulton factory and each one consisted of a number of glazed tiles with an inscription and decorative motif. 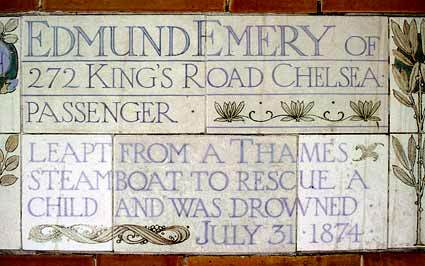 This one tell the tragic tale of an Edmund Emery who met his maker after leaping from a steamboat on the Thames to save a drowning child in 1874. Before his death, Watts erected 13 tablets, with his wife Mary adding a further 34. 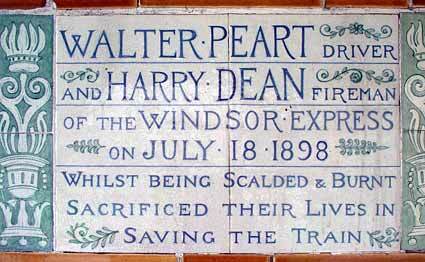 This attractively presented tablet documents the fate of Walter Peart and Harry Dean, driver and fireman on the GWR Windsor Express, who 'sacrificed their lives in saving their train' in 1898. Sarah Smith, pantomime artiste. At Prince's Theatre died of terrible injuries received when attempting in her inflammable dress to extinguish the flames which had enveloped her companion. January 24 1863. Joseph Andrew Ford aged 30, Metropolitan Fire Brigade. Saved six persons from a fire in Gray's Inn Road but in his last heroic act he was scorched to death. Oct 7 1871. William Donald of Bayswater aged 19, railway clerk, was drowned in the Lea trying to save a lad from a dangerous entanglement of weed. July 16 1876. George Lee, fireman. At a fire in Clerkenwell carried an unconscious girl to the escape falling six times and died of his injuries. July 26 1876. Ernest Benning, compositor, aged 22. Upset from a boat one dark night off Pimlico Pier grasped an oar with one hand supporting a woman with the other but sank as she was rescued. Aug 25 1883. Thomas Simpson died of exhaustion after saving many lives from the breaking ice at Highgate Ponds. Jan 25 1885. Thomas Griffin, fitters labourer April 12 1899. In a boiler explosion at a Battersea sugar refinery was fatally scalded in returning to search for his mate. George Stephen Funnell police constable Dec 22 1899. In a fire at the Elephant and Castle, Wick Road, Hackney Wick, after rescuing two lives, went back into the flames, saving a barmaid at the risk of his own life. Henry James Bristow aged eight - at Walthamstow on December 30 1890 - saved his little sister's life by tearing off her flaming clothes but caught fire himself and died of burns and shock. Robert Wright, police constable of Croydon. Entered a burning house to save a woman knowing that there was petroleum stored in the cellar - an explosion took place and he was killed. April 30 1893. John Clinton aged 10 who was drowned near London Bridge in trying to save a companion younger than himself. July 16 1894. Update: June 2009. A new plaque. In June, 2009, the first new plaque for over seventy years was unveiled in the park. The plaque pays tribute to Leigh Pitt who bravely jumped into a Thamesmead canal to rescue a nine-year-old boy who had fallen in and was struggling to stay afloat. Pitt selflessly dived in and held the child, Harley Bagnall-Taylor, above water line before passers-by were able to rescue the boy, pulling him out with a hosepipe. Sadly, Pitt was unable to haul himself over the high canal walls and subsequently drowned. 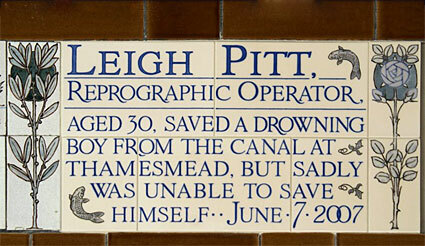 LEIGH PITT, REPROGRAPHIC OPERATOR, AGED 30, SAVED A DROWNING BOY FROM THE CANAL AT THAMESMEAD, BUT SADLY WAS UNABLE TO SAVE HIMSELF, JUNE 7 2007. One last look of the the small park, showing how closely it is bounded by office buildings.